It’s been nearly a year since former Egyptian president and Muslim Brotherhood leader, Mohamed Morsi, was removed from power by the country’s military, following huge demonstrations in Cairo and throughout the nation. On May 26-27, presidential elections will be held in Egypt, whose fairness has already been questioned and which will almost certainly result in victory for Abdel Fattah El-Sisi, the former general who led the military takeover. As a new Pew Research Center survey highlights, most Egyptians still favor Morsi’s ouster, but the public mood is grim, and Sisi’s support is limited. 1 Egyptians are about as unhappy with the direction of their country as they were back in spring 2010, less than a year before the revolution that toppled then President Hosni Mubarak, following 18 days of protest in Cairo’s Tahrir Square. Today, 72% of Egyptians are dissatisfied with the country’s direction, while just 24% are satisfied. 2 A slim majority (54%) of Egyptians have a positive opinion of Sisi, and the same percentage say they favor last July’s military takeover that dislodged President Mohamed Morsi and the Muslim Brotherhood from power. These slender majorities may be lower than some expected, given that media reports from Egypt over the last year have often emphasized Sisi’s popularity and broad support for the takeover. 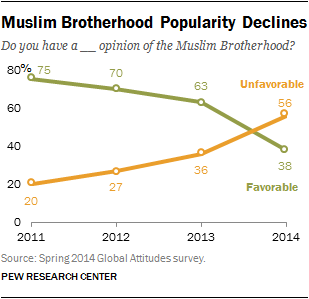 3 The Muslim Brotherhood’s ratings are down – but a substantial minority still like them. Three-in-four Egyptians had a favorable opinion of the Muslim Brotherhood back in 2011, in the months after Mubarak’s ouster, but in the current poll just 38% hold this view. Once again, this is a higher number than some might anticipate, given that over the last year the new government has banned the group and labeled it a terrorist organization. 4Roughly six-in-ten (59%) say democracy is preferable to other types of government, although this is down slightly from 66% last year. Most also continue to say it is important to live in a country with specific democratic rights and institutions, such as a fair judicial system, a free press and freedom of speech. 5 When asked about the tradeoff between democracy and stability, 54% of Egyptians say that having a stable government is more important, even if there is a risk it won’t be fully democratic. Only 44% think having a democratic government is more important. 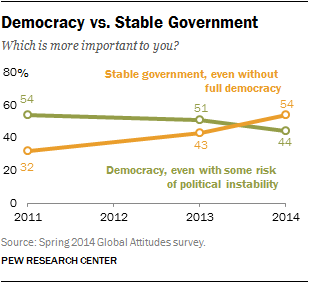 This is a shift from previous surveys, when Egyptians placed a greater priority on democracy than stability.